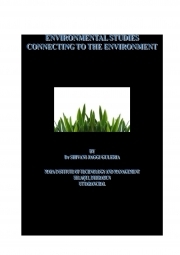 Description of "Environmental Studies e-book-id: 178474 (eBook)"
This book contains four chapters which connects you to the environment and provide in-depth knowledge of the subject as designed by UGC for the undergraduate courses in science, engineering, commerce, management, law, pharmacy and B.Ed. Various case studies have been incorporated in each chapter to make you aware of the problems. Various concepts are explained with figures and illustrations to simplify it. At the end of each chapter solved objective questions are given to enable the reader to prepare as per the university pattern. Reviews of "Environmental Studies e-book-id: 178474 (eBook)"
This is a well written book on environmental studies which is available along with multiple choice questions as per the university pattern.The author have described the problems related to the environment along with different case studies.